Alaska State Troopers are investigating allegations that a Village Public Safety Officer (VPSO) used a stun gun or Taser on two young boys after they asked the officer to do so. The mother of one of the boys, Terry Ward, said the incident occurred last December when a group of about eight or 10 children were getting ready to play a game of kickball outside the Boys and Girls Club in Kake, Alaska, local media reported. The club is situated next to the VPSO office. When one of the officers walked by the boys, Ward’s 11-year-old son and one of his friends reportedly asked the policeman to use his Taser on them. “They were talking about being Tased, and my son did ask to be Tased, and he Tasered him on his arm or his wrist,” Ward told the local Juneau Empire newspaper. She said she didn’t know if the weapon he used was a Taser or a stun gun. 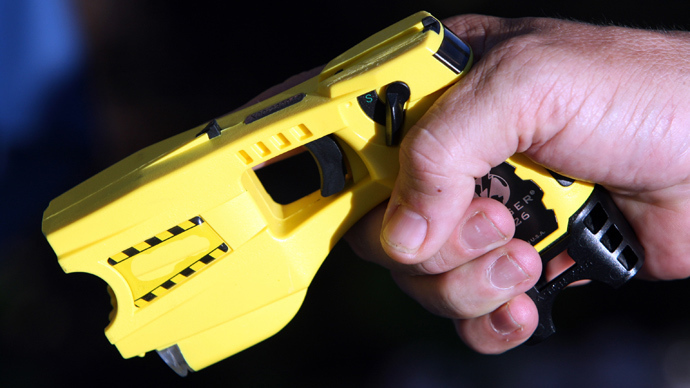 A Taser shoots barbs into a person’s skin, whereas a stun gun is just put next to the skin. Although the boy wasn’t harmed in the incident, Ward worries that there may be a lasting psychological or emotional effect, and says that a VPSO officer should know better than to Taser a child. “I’m just not happy about the situation. To me this is considered child abuse,” she said. Ward is also concerned about the fact that she was not properly informed of the incident by the authorities. She only found out about the incident from a friend about a month later. “She was asking me how my son was doing after the incident, and I was like, 'What is she talking about? '” Ward said. Alaska State Troopers, who supervise the VSPOs, are now investigating the incident. Kake is a small remote community about 100 miles south of Juneau, the capital of Alaska. The VSPO is the only permanent law enforcement presence in the town. A spokeswoman for the Alaska State Troopers, Megan Peters, based in the city of Anchorage, told the Juneau Empire that the VSPO officer concerned is Mac McGonigal, who was assigned to Kake in 2013. The Empire reported that it attempted to get his side of the story, but that no one was at the office on Friday despite multiple visits. Ward says this was not the case, claiming she was only contacted a week ago by the head officer in Kake, James Smith, who asked her to come to the office. She refused unless a lawyer was present. VSPO officers are trained to deal with public service emergencies and basic law enforcement. They do not carry firearms.